℗ 1984 EMI America Records. © 1984 EMI America Records. F.Y.I. 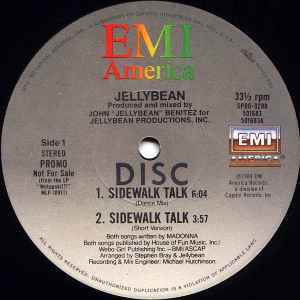 : The story goes... Madonna was able to get Sire Records to let John "Jellybean" Benetiz work on her first album & 12" singles, in exchange Jellybean wanted her song "Sidewalk Talk" for his first album (which was later released as "Watupski!?! "), and Madonna reluctantly agreed. The song "Sidewalk Talk" was then mixed to push Madonna's vocals to the background and a new singer named Catherine Buchanan was brought in to sing over Madonna's vocals, thus making Catherine's vocals the lead vocals- although it sounds like a duet. The 2 background singers from Catherine's sessions, Audrey Wheeler & Cindy Mizelle confirmed this in an interview later. Regardless, it ended up working in Madonna's favor because not only did she have LIKE A VIRGIN LP riding the charts in 1984 but she also had "SIDEWALK TALK" climbing the dance charts, credited to her, followed into 1985 with the singles "INTO THE GROOVE" (From 1985's "Desperately Seeking Susan" Soundtrack) as well as "CRAZY FOR YOU" & "HE'S A GAMBLER" (From the 1985 "Vision Quest" Soundtrack). Madonna was then truly all over the place tangled in bangles and beads and thus beginning her historical climb up the ladder of fame. Catherine Buchanan did not fare so well..... she practically went unnoticed until her comeback attempt in 1988 when she released the 12" single "LOVE IS", which she wrote, and that song sounded so much like "SIDEWALK TALK"....... Mention "SIDEWALK TALK" today and all you hear is Madonna's name as the singer.